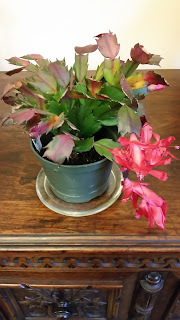 This is the picture of that same plant this week. Bigger. More bloomy. At the risk of overusing the metaphor, the plant continues to remind me of the uncontrollable nature of the sacred in our lives, and the surprising blessings that occur when one is able to surrender to dreams and possibilities. Today begins the eighth pilgrimage I have been privileged to lead to the Corrymeela Peace and Reconciliation Centre since I was a mid-term volunteer in the summer of 2011. This represents over 70 people that have visited the Centre and learned about the work of peace and reconciliation and have then been challenged to apply that learning in their own contexts. I have been told that in some way most have been transformed by their experience. I continue to be amazed by this realization of a wild and improbable dream that began six years ago as I planned a sabbatical with very little knowledge or understanding of what I was getting into at the time. The whole adventure has been such a blessing in my life. And the people that I have worked with along the way, that have planned and co-led the trips with me ... Sarah, Alana, Ariane, Bridget, Kendra, Kathryn, Wilf, Rick, Diana, ... and of course Paul from NI, I owe a huge debt of gratitude for joining me in the improbable dream. Today I am here with my daughter Alana who has accompanied me and co-led many of the trips, and has her own network of friends in Ireland. We are waiting for the others to arrive today. We are a small group this time – Diana, who is my co-leader this trip, Lance and Katie from the congregation where I serve, and Karen who works with Alana in Toronto with the GO Project. Sadly, two others who were to join us were not able to come because of recent serious health issues, but I am glad to report that both are recovering. As I enjoy a quiet morning at Farset International Hostel, reconnecting with old friends, I am filled with gratitude for another opportunity to be in this place, with these people. Many folks have heard me say over the years “this is probably the last trip” … and yet, there always seems to be one more. Just like the cactus plant that didn’t die when I thought it would. The weather in Ireland is unreal ... sunny and warm. Just right for growth and bloomy-ness. I have one of those plants Martha...and it continually inspires me. I have no idea when it is going to blossom...but it always does so at the most wonderful times...the energy created by positive change or at times when there is chaos and upheaval. I have let it go months without watering or nuturing it....and bloom...there she be. The first time I noticed it was when we were at the west mall renovating the condominium, so much chaos and excitement. its Amazing. So glad you and Alana arrived safe. Concerned about the two left behind. If you could face book me that would be great! Enjoy your time....and Blog lots! !